Tuesday night was a heartbreaker for the Minnesota Wild and their fans. With 7.1 seconds left in the third period, Mika Zibanejad scored to take the game to overtime where the Senators would eventually net the game winning goal in OT. By all accounts it was a game that the Wild should have won. Instead, they walked away with only one point, when they really needed two points to begin to pull away from Colorado in the chase for the final wild-card playoff spot. As a consequence they now are one point behind the Avalanche heading into tonight’s game in New Jersey. Still it comes as no surprise that the Wild lost in the overtime frame as they have had massive issues coming away with a win in the overtime/shootout period all season. Of the 13 overtime/shootout games the Wild have played in they have only won two of them all season (2-11), which means the Wild only win 15% of the time in the extra frame or if it goes even further to a shootout. The Wild’s two overtime/shootout wins are the lowest by any team in the NHL. There are four teams in the league with more overtime losses, but all of them have managed to win more overtime/shootouts than the Wild. So what exactly has been the cause of the Wild’s overtime troubles? The Wild are having trouble putting the puck on net, and stopping opponents from putting the puck on their net in the new 3-on-3 format. In the 13 overtime games the Wild have played this season they have generated only 25 total shots. Compare this with their opponents who have shot 30 times on the Wild, you can see it’s a -5 shot differential. Drill that down even further, the scoring chances break out in much the same way with the Wild being bested by their opponents. As it stands today the Wild are sitting at a -4 scoring chance differential from their opponents in overtime. Furthermore, with only one goal scored all season during 3-on-3 play the Wild are sitting at a goal differential of -9. For a team with a +9 goal differential overall on the season this -9 overtime goal differential shows that in overtime they are struggling to find a system that works. They obviously have worked to get their overall goal differential back into the green during regulation, but are the coaches and the players making the adjustments needed for 3-on-3? Perhaps it might be time to reexamine the system, personnel, and possibly make a more concerted effort to practice 3-on-3. The generally accepted strategy personnel wise for 3-on-3 around the NHL is to play two forwards and one defensemen. This puts pressure on the forwards to be able to try and score the game winning goal and prevent it from being scored at the same time. It takes a true two-way forward to step in and not only lead the scoring rush when needed, but backcheck when the other team makes their scoring rush. The best example of an overtime two way forward in the NHL is Johnathan Towes who currently leads the league with 5 overtime game winning goals. The former Selke Trophy winner’s success in overtime should not be a surprise to anyone as he brings a two-way game where he can put the puck in the net and help the lone defensemen prevent the other team from scoring. 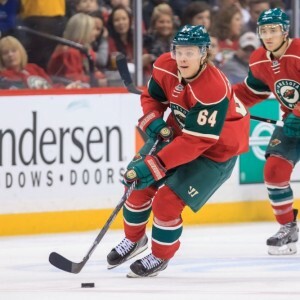 The Wild right now do not have a true dominate two-way talent like Towes. Koivu and Grandlund could fill that role, but neither has seemed to be able to net an overtime winner. All the other Wild forwards are largely role players and weak on either scoring or backchecking. This needs to be an emphasis item going forward in player development on developing and brining in players that can play the two-way game needed win in overtime. Considering the overtime period is only 5 minutes long you really only need a few “overtime role players”. The NHL has deemed the 3-on-3 overtime as a huge success based on its narrative and the introduction of it as the game format for this season’s All-Star Game tournament. The format is here to stay for the very foreseeable future. The Wild need to adjust and learn to win 3-on-3 or continue to loose valuable points that add up at the end of the season. Michael Russo of the Star Tribune explains why the overtime frame is important best in his blog from yesterday “Why’s that key? Because if the Wild and Avs tie in points at the end of the year, regulation/overtime wins is the first tiebreaker.” Right now the Avs have the upper hand…hopefully the Wild realize that next time they head into overtime game this season.